What do microbes have to do with regolith development and gold exploration? How would you best sample vegetation for mineral exploration? Where was the dust that recently blanketed Eastern Australia sourced from? How long does it take termites to cycle quartz grains through the soil? The answers to these questions, and many more, can be found in Regolith and Landscapes in Eastern Australia, the proceedings of the First CRC LEME short regolith conference. 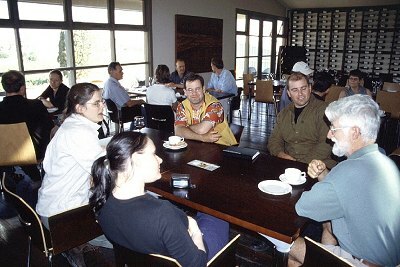 The conference, sponsored by CRC LEME and the Minerals Council of Australia, was held at the University of Canberra over 21 and 22 November 2002. Seventy five registrants consisted of CRC LEME research students and staff from the Australian National University, Geoscience Australia, University of Canberra and University of New South Wales plus researchers from the ANU, CSIRO Land and Water, Geoscience Australia, Department of Natural Resources and Energy, Victoria, NSW Department of Land and Water Conservation, NSW Department of Minerals Resources, Macquarie University, University of Melbourne and University of Adelaide. The conference was designed to highlight the richness of research currently being conducted under the CRC LEME banner in Eastern Australia, as well as to allow other regolith researchers outside the organisation to show off their own work. Also, the achievements of Professor Tony Eggleton and Associate Professor Graham Taylor, two of LEME-1's stalwarts, were celebrated by awarding the Taylor & Eggleton book award to the best student presentation at the conference. Students were the principal focus of the conference, which was well-attended by undergraduate, Honours and postgraduates from throughout eastern Australia. Professor Roger Dean, Vice Chancellor of the University of Canberra, and Dr Dennis Gee, CEO of CRC LEME, opened the conference and each spoke of their ambitions to encourage innovation in research, the former in science generally, and the latter in regolith science focussed on the needs of its end-users. Keynote speaker Associate Professor Graham Taylor stressed the need for the CRC backing innovation, praising the Gilmore project and research in the Broken Hill area by Steve Hill and team. Graham also called for empirical research (which he called "stamp collecting") being backed up by more fundamental research into processes. After all, many of the regolith techniques currently used in mineral exploration are known to work in certain regions, however, often we don't truly understand why they work, there and perhaps not in other areas. What then followed were a series of excellent, very professional presentations and posters delivered primarily by CRC LEME research students from the ANU and UC. A number of CRC staff and researchers from other institutions (above) also contributed presentations and posters, ensuring a packed program. Themes for the conference included: Soils and Sediments; Water and Salt; Mineralogy, Microbiology and Resource Management; Mapping and Landscape Evolution; and Minerals, abbreviated by a mid-conference barbecue dinner on the lawns at UC. Each of the presentations served to highlight the diversity of research being conducted on regolith in Eastern Australia. Keynote speaker Professor Tony Eggleton closed the conference by delivering an insightful presentation on the past and future of regolith research, which can be downloaded in PDF form here. Frank Reith (CRC LEME/ANU PhD scholar) "Interactions of microorganisms with gold and regolith materials from a gold mine near Mogo in southeastern New South Wales". Angela Ratchford (CRC LEME/UC Honours scholar) "Regolith influence on surficial water chemistry at Hovells Creek, central west NSW: dryland salinity hazard mitigation in high-relief granitic landscape" (with C. Leah Moore). Awarded in Angela's absence. Leanne Hill (CRC LEME/ANU PhD scholar) " Branching out into biogeochemical surveys: a guide to vegetation sampling" and "A method of bulk sampling wet and dry atmospheric deposition for trace element analysis" (with Patrice de Caritat). As conference convener I was enormously excited by the breadth and depth of research presented and the excellence of the written abstracts, presentations and posters. Much of the research was of direct benefit to the minerals exploration industry, however, other disciplines including salinity mapping and management, agriculture, acid sulphate soils mapping and management, regolith mapping, landscape evolution, regolith geochemistry and biogeochemistry were also included. The conference was a very potent tool for showing off the research but also for allowing cross-fertilisation of ideas between the different participants. To close the highly successful conference, 40 delegates were treated to an afternoon looking at some particularly Eastern Australian-flavoured regolith at a parna site near Sutton, NSW, and overlooking Lake George, NSW, lead by Graham Taylor. The party then retired to Madew's Vineyard on the footslopes of the Lake George Fault to enjoy the fruits of Pleistocene strandlines prominent on the Lake's northern side. Comments? Overall a highly successful conference, marred only by a forgotten password to the university computer system (which was quickly rediscovered). Delegates left happy, well fed, and enthused to continue their research in their own particular disciplines but also with a greater knowledge of the existing and possible synergies between all the disciplines that make up regolith science. Congratulations to all participants on a wonderful conference and thanks to all the session chairs (Bear McPhail, Peter Lewis, Colin Pain and Pat James). Personally, I am looking forward to participating in next year's conference, to be held at the ANU towards the end of November 2003. Keep an eye on the LEME WWW page! Copies of the abstract volume (136 pp + CD-ROM) can be purchased directly from CRC LEME via the WWW site for A$44.00 including GST. Conference convener and extended abstract volume editor. 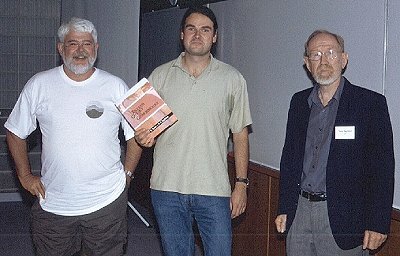 Figure 1: Taylor & Eggleton book award winner Frank Reith (ANU PhD scholar) accepts his award from Graham Taylor (left) and Tony Eggleton (right). 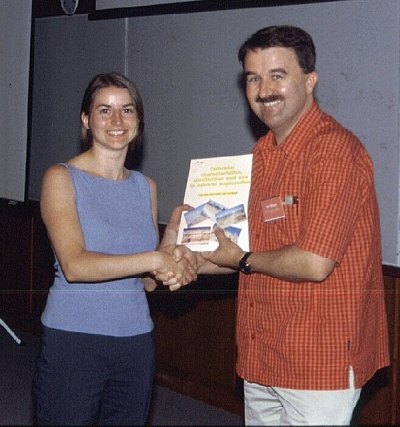 Figure 2: Editor's Choice book award winner Leanne Hill accepts her prize from Dr Ian Roach, conference convener and abstract volume editor. Figure 3: An excitable (and exciting) crowd on the post-conference field trip to the Sutton parna field site. Figure 4: Enjoying the ambience (and talking about regolith) at the end of the post-conference field trip at Madews Vineyard, Lake George, are (L-R) Nerida Reilly (GA), Linda Bibby (NRE Vic), Michael Holzapfel (CRC LEME/UC), Steve Hill (CRC LEME/UC) and John Rogers (ANU).